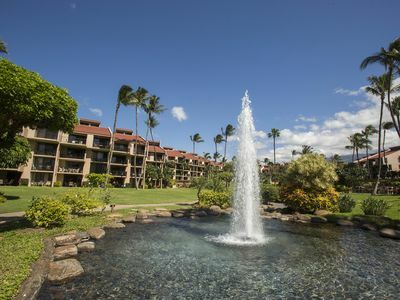 We are a 2-3 minute walk to beautiful Kamaole Beach III. Our building is located in quiet building 5 on the 2nd floor. Our unit is close to the elevator but far enough away to not hear it. 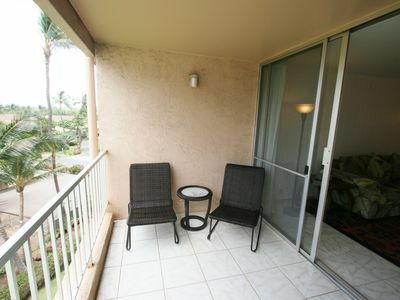 Additionally, there is a beautiful ocean view from our lanai! 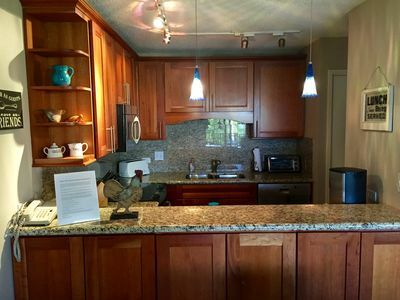 - Both bathrooms have been remodeled with new granite counters, new sinks and faucets. 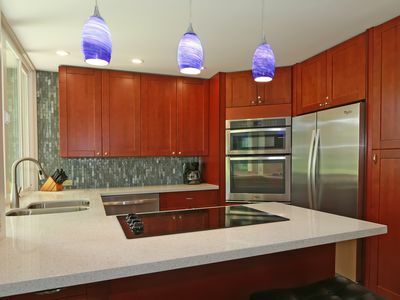 The kitchen is well equipped with granite counters, a built in microwave and stainless steel appliances. A new sofa has been added to the living room along with a new 46' flat screen TV and a new Blue Ray Player. 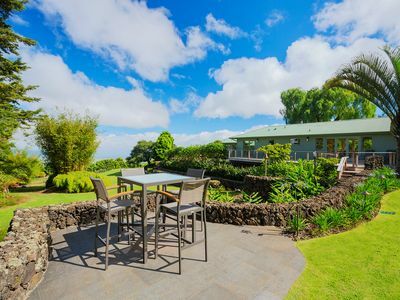 Enjoy the beautiful lanai to relax or dine outside while taking in the beautiful garden views of the 15 acre tropical resort. 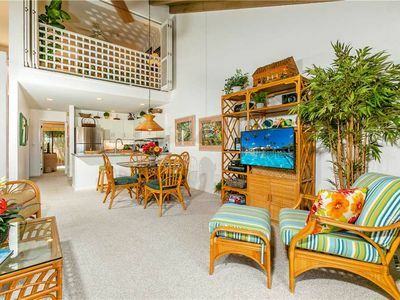 You will also see an ocean view! 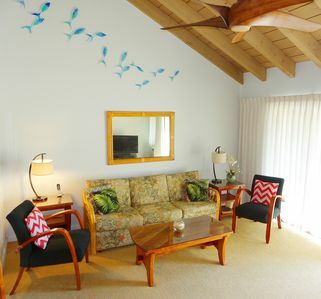 It is our ultimate goal to provide you with an excellent vacation experience. 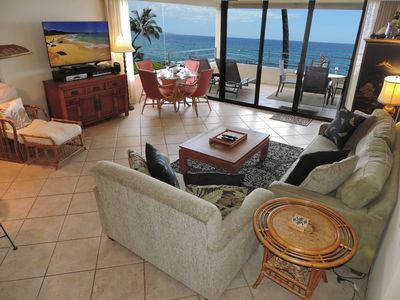 This is not a typical rental as we treat our unit as our second home. 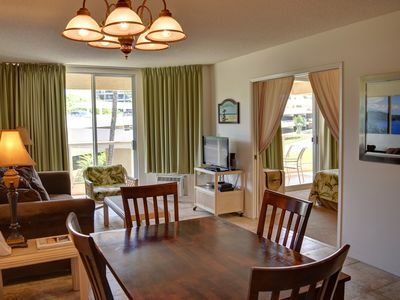 Since you rent "owner direct" from us, we are able to provide you a quality condo at a very competitive price! 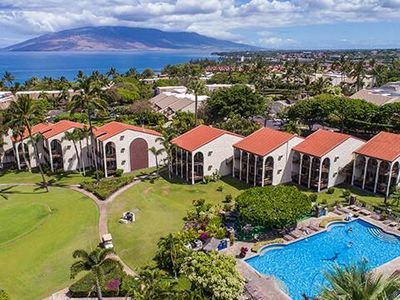 Our 1 bedroom 2 bathroom remodeled condo is a large 818 square feet and located in the magnificent Kamaole Sands resort in South Maui. With convenient elevator access to the 2nd floor, it is located in the very quiet building 5, which is know as the 'inner courtyard'. 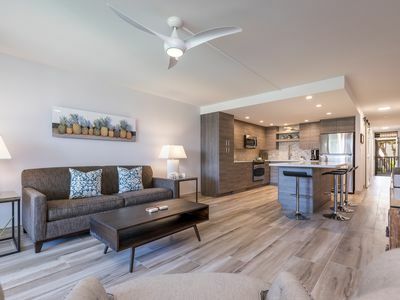 ADDED FEATURE: WHEN BOOKING OUR CONDO FOR TWO WEEKS OR LONGER, YOU WILL RECEIVE A COMPLIMENTARY 'REFRESHER' HOUSEKEEPING VISIT DURING YOUR STAY. FREE HIGH SPEED INTERNET (wireless) is provided to all our guests for your computer. and prepaid by the owner. 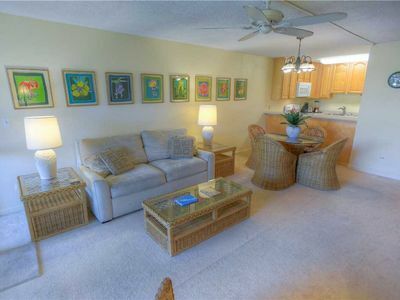 The condo is stocked with a beach Umbrella, Cooler, Two Boogie Boards, and two new Tommy Bahama Beach Chairs. 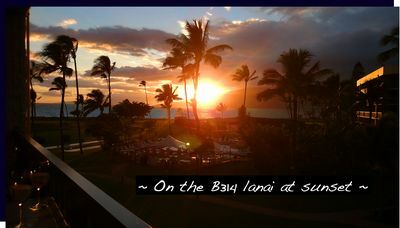 SPAS/RESORTS Less than 5 minutes away: Four Seasons Resort, The Grand Wailea, Fairmont Kea Lani, Wailea Beach Marriott. 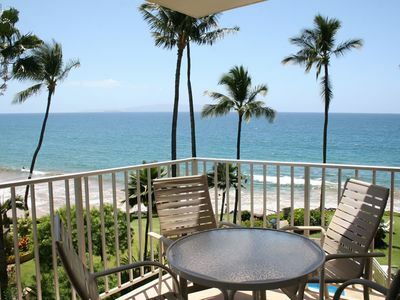 Anytime of year is a great time to visit Maui! With the cool Trade Winds, the summers are cooler than most mainland summers, and the winters are famously warmer. 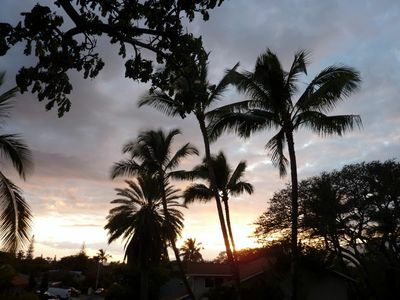 Kamaole III beach is across the street with it's beautiful protected beach and grassy play areas, playgrounds and shady trees on the upper level. 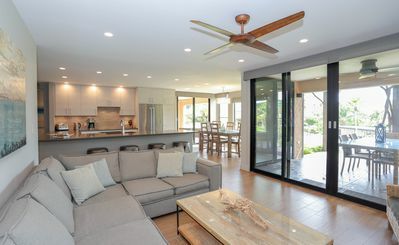 We are walking distance to several restaurants and shops, and less than a five minute drive to the exclusive Wailea shops, golfing and restaurants. There are grocery stores (Safeway, Star Market and Foodland) and many reasonably priced to expensive restaurants, boutique shops and souvenir shops. 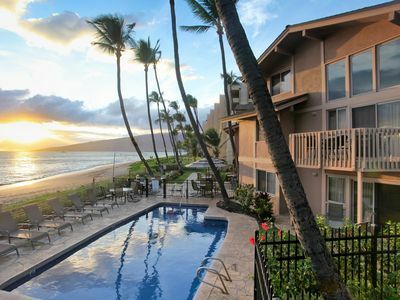 We love being able to help our guests enjoy their time in Maui, so we are pleased to offer you a luxurious retreat for a reasonable price. 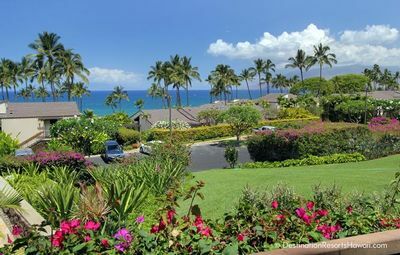 For a relaxing longer and quieter stay, come visit us from June thru October when the crowds are gone but the natural attractions of Maui are still abundant. 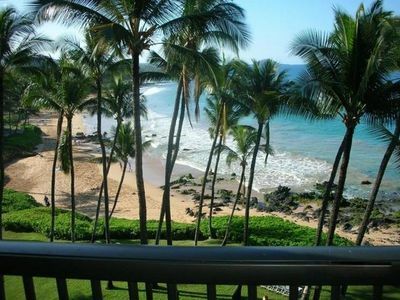 Sun baked beaches, warm ocean waters...treat yourself to an unforgettable and wonderful vacation! 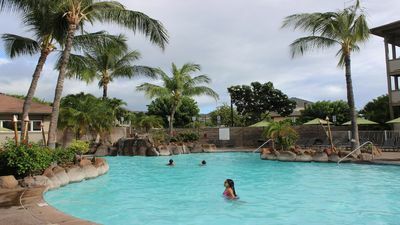 ONSITE FEATURES at Kamaole Sands include a large swimming pool, two hot tubs, a children's wading pool, four tennis courts, snack bar, activity desk, exercise room and eight barbecues with picnic areas. - COMPLIMENTARY coffee and local newspaper are available from 7am to 9am in the lobby area. - COMPLIMENTARY Mai-Tai party with live music every Wednesday in the pool area. - The 24-hour front desk offers wake up call and dry cleaning services. BOOK NOW & SAVE! 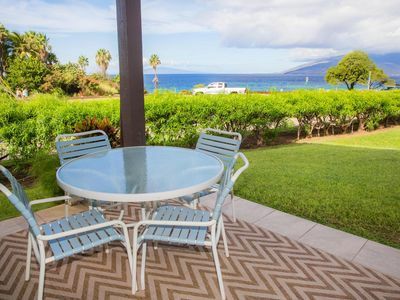 Terrific Value in the Heart of Kihei!